The police infiltrates the mob, the mob infiltrates the police, people take advantage of people, they kill and betray for money, while a few others try to fight them all in hope of truth and justice. Ji Hyung Min (Lee Jae Yoon) and Lee Kyung Mi (Go Na Eun) are two police officers, a couple, in midst of all chaos revolving drugs and killing. 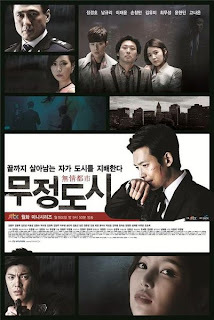 They try to hunt down the head of the mob, thinking it is Docter's son, Jung Shi Hyun (Jung Kyung Ho) and old friend of Lee Kyung Mi. Yoon Soo Min (Nam Gyu Ri) is the younger sister of Lee Kyung Mi and ends up falling in love with Shi Hyun, not knowing his real identity. Will she choose love or revenge? Or will she even have the choice . . . This drama is so crazy, first of all, all those undercover agents, its like the police consists of the mob and the mob consists of the police, okay exaggeration but yeah that's the feeling. And oooooh my God, Jung Kyung Ho (Smile, you) I had not expected this role to fit him like this, he did a great job, though he did have the same face expression a lot, this role suits him. The story was good, nice, and I like the way it turned out, but I wished for a tiiiiiiny bit of more romance, it stayed a bit in the background, but it was still there. There was friendships and such as well (me like) and a lot of times there were some huge twists that would make your jaw drop. And so many times I would say about the characters "I hate this guy" then later "ok nevermind I like him" hahah.. also all those people working with drugs, we didnt really see a whole bunch of people take drugs but we did see consecuenses of drugs, which was actually cool, but I'm guessing it's because of the broadcast station. Anyway, I recommend this drama! I enjoyed it! it's a cool police-mob drama.